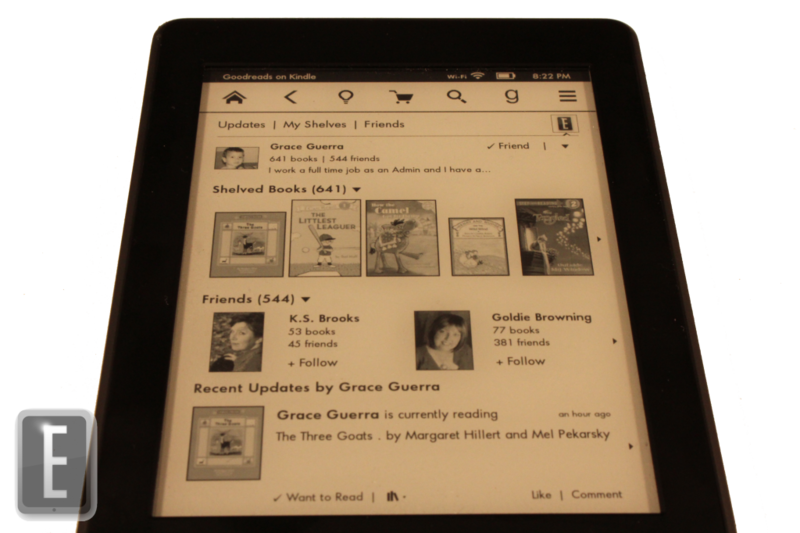 The Amazon Kindle Paperwhite 2 received a new firmware update today that adds GoodReads to the main navigation bar. This allows readers to connect up to the service with their Facebook or GoodReads account and participate in a social eBook community. If you are new to the service you can use this social platform to connect up and befriend other likeminded souls that have the same taste in books as you do. You can click on their name and see all of the books they have ever read and what books they are in the process of reading. If you see a book you like, you can click on it and be directed to the Kindle store, where you can check out reviews, ratings and buy it. When you are reading a Kindle eBook and tap on the social button you can now update your status just on GoodReads. Before, you could only share it on Facebook and Twitter. It obviously makes sense to update your status on a book social site then it does spamming your friend-list on Facebook. There are a few bugs with the recent firmware. If you click on a user and then check out what books they are reading and then click on one you are not directed to the exact listing in the Kindle Store. Instead, it takes the name of the book and does a broad search, sometimes not giving you the book you were looking for and listing others that are completely unrelatable. I live in Canada and I could not fetch the update automatically with my Paperwhite 2. Instead you have to visit the Kindle Firmware Update Page, download it to your PC and then copy the file to the root of your device. You then click settings and Update Your Kindle will be clickable and it takes around 10 minutes to fully update.